On November 5, 2013, Colorado voters will face a ballot measure that increases state individual income taxes by $950 million in its first year. The state individual income tax would become a two-bracket system, rather than a single rate applied to all incomes (see Table 1). This large tax increase will have negative effects on the economy of Colorado. In particular, this will increase taxes on small businesses filing through the individual income tax code and low- and middle-income taxpayers. Colorado’s economy is strong when compared with the rest of the country, but much of this strength is due to the robust economy of the Denver metropolitan region. This area comprises the largest part of the state economy (nearly two-thirds of output and half of employment). The economy in other areas of the state has been more variable, however. Some regions—like the Northern region, Southwest Mountain region, and the Mountain region—have seen a strong and stable economic recovery, as reflected by increased employment, a healthy real estate market, and promising retail sales. Areas such as Colorado Springs and the Western region are finally exhibiting indicators of economic improvement after the recession. Other portions, such as Pueblo, the San Luis Valley region, and the Eastern region have seen much slower recovery. For example, consumer spending has declined or been flat in these three portions of the state. Rural areas that largely depend on the agricultural industry have seen lower incomes and general economic hardship due to severe drought this year, which decreased livestock herd numbers, crop production, and meat production. Increased feed prices during the drought forced ranchers to sell herds “because [they] could no longer afford to feed them.” The recent floods within the state have further harmed the agricultural sector. Property losses from the flooding may reach $2 billion, and there is worry that standing water will further damage crops. Although Colorado’s economy continues to outpace the national economy, the pace of growth slowed somewhat through the summer of 2013. Job gains continue in most sectors and regions of the state. However, the unemployment rate has begun to level off, potentially indicating a slowdown in entrepreneurial activity and farm employment. Personal income, wages, and consumer spending continued to grow through the first half of the year, but at slower rates than in 2012 as households and businesses responded to changes in federal fiscal policy and economic uncertainty. Other economic analyses also find modest growth in areas outside of Denver. For example, Colorado Springs is the second largest metro area in the state and a significant portion of the area’s employment comes from the federal government; thus, federal spending cuts are having an effect on the local economy. This area has experienced lower job growth than the state as a whole, in addition to a higher unemployment rate. There is very good evidence that taxes and economic growth are negatively related, contrary to arguments claiming that higher taxes will not be a detriment to state economies. We recently completed a literature review encompassing 26 academic studies related to economic growth and taxation—23 of those found that higher taxes were associated with lower growth. There may not be a unanimous consensus on the taxes versus economic growth debate, but the claim that taxes in general have “little influence” on state economies is false. Tax increases leave less money in the pockets of small businesses, entrepreneurs, and consumers—money that could be invested back into the Colorado economy, further propelling the state’s economic recovery forward, or that can cover basic expenses for low-income households. Broad majorities say the government’s policies following the recession have done not much or nothing at all to help poor people (72%), middle-class people (71%), and small businesses (67%). Amendment 66 increases taxes on small businesses, the poor, and the middle-class. With the public concerned about low-income people, the middle-class, and small businesses, it is not prudent to increase taxes on those struggling groups. This $1 billion tax increase will do just that. Amendment 66 increases the tax rate on all taxpayers filing taxes through the individual income tax code. The majority of businesses in the U.S. file their taxes through the individual code. These firms are known as “pass-throughs” or “flow-throughs” because the owners’ income is “passed through” to the individual and paid by the individual rather than by the business entity. Based on a 2011 Ernst and Young study, 95 percent of all Colorado firms in 2007 were pass-through entities, meaning that a significant majority of firms within the state paid the individual income tax. Amendment 66 increases the tax liability on all of them. Figure 1, below, shows a breakdown of Colorado firms, by type of legal organization. Data from the U.S. Small Business Administration indicates trends similar to those found in the Ernst and Young study, as shown in Table 2. The majority of firms have less than twenty employees (88.6 percent). Further, 20.2 percent of all employment is found at businesses with less than 20 employees. Many of these firms pay the individual income tax on their business income, rather than through the corporate income tax. While some argue that small businesses do not generate major employment or engage in significant hiring, this claim is false. Fifty-seven percent of Colorado employment was from pass-through businesses in 2007 (Figure 2 below outlines employment by type of firm). Entrepreneurship, as measured by the activity of start-up firms and young businesses, is an integral part of employment growth and is a key to economic vitality. Entrepreneurs and new businesses find ways to profitably produce goods and services as they strive to discover the most valued uses of the economy’s scarce resources. In doing so, they also provide opportunities for the unemployed or underemployed while utilizing the economy’s idle or underused resources. This activity generates wealth and spurs economic growth…New and young firms are a leading source of new jobs for the economy. Thus, the proportion of a state’s employment in new and young firms correlates highly with a state’s overall employment growth, meaning that higher levels of entrepreneurial activity are closely associated with higher levels of employment growth. Though some are skeptical that taxes are a consideration for small businesses, polling indicates differently. In a Gallup survey conducted earlier this year, taxes were one of the top concerns of small business owners. Fifty-three percent of respondents said taxes on small businesses were “hurting [their operating environment] a lot”; 27 percent said “a little.” Only 17 percent said taxes had no effect (and only 2 percent said taxes were helping). The cost of healthcare was the only concern outranking taxes. Taxes are indeed a pressing consideration for small business owners, and based on the opinions expressed in the Gallup poll, increasing their taxes would harm their operating environments and leave less available funding to reinvest back in their businesses. 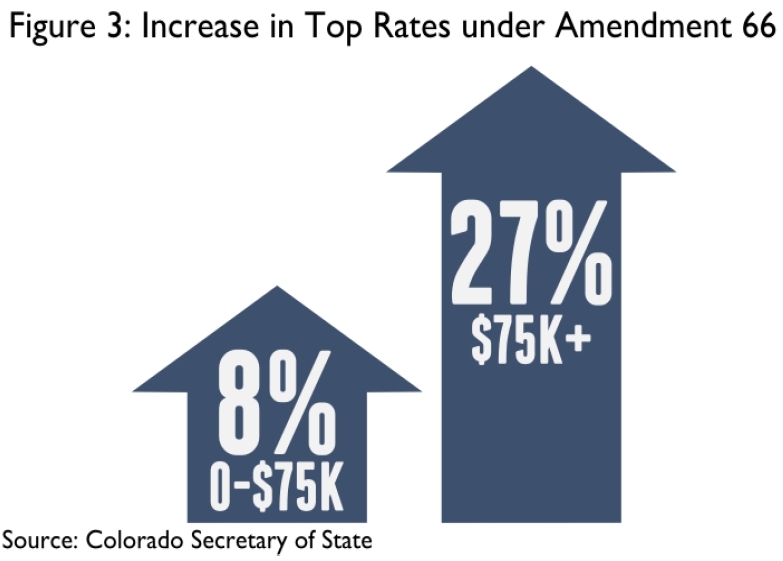 Amendment 66 increases taxes on all Colorado taxpayers—including the poor and the middle class. While some taxpayers in higher-income ranges will see a 27 percent increase in maximum rate, even the lowest-income Coloradans will see a tax rate increase of 8 percent. In particular, individuals with incomes below $75,000 would face a 5.0 percent rate, rather than the current 4.63 percent (an 8 percent increase). For taxpayers with incomes above $75,000, their first $75,000 of income would be subject to the 5.0 rate, but income above that would be subject to a top rate of 5.9 percent (a 27 percent increase in top rate). Figure 3 shows the increase in top rate faced by various income levels. Colorado income trends behave differently depending on how one defines “income.” Often, personal income per capita is used to account for changes in population and can be thought of as “average” income, but median household income is a better reflection of the income constraints of the typical household. It captures the “middle household”—the household at which 50 percent of household incomes are above and 50 percent of household incomes are below. When an average measure is used (such as per capita income), the result can be heavily influenced by outliers and thus not reflect the true central tendency of the data. Using personal income per capita paints a misleading picture that typical Colorado household incomes are rising, when in fact typical household incomes remained flat between 2010 and 2011. For this reason, we have used median household income in Colorado to demonstrate the lack of income growth after the recession. See Table 3.
the greater proportion of renters has caused the vacancy rate of apartments and other rental properties to reach record lows in many areas. This has resulted in high rents in parts of Colorado, especially in urban areas… the very high average rent rates in Colorado will put upward pressure on renters’ cost of living in 2013 and 2014. Proponents of Amendment 66 argue that a person making $30,000 per year will pay “about $4 per month” more in taxes, or the cost of “an ice cream cone.” At this income level, the additional $4 a month in taxes from Amendment 66 is better characterized as one less meal, not one less leisure good (such as an ice cream cone). For example, the Bureau of Labor Statistics indicates that the average price of a gallon of milk was $3.53 in January 2013. A gallon of milk is approximately the amount for one person for one week. Though $4 per month seems miniscule upon first glance, it is important to remember that the $4 lost to higher income taxes will make it that much more difficult to pay for basic necessities. In light of higher costs for household necessities and relatively flat Colorado income levels, increasing individual income taxes would further reduce the take-home pay of low- and middle-income Coloradans, adding a second round of austerity to already cash-strapped households. Colorado’s economy, though strong, is not invincible. It is highly dependent on the performance of small businesses within the state. Not only do these businesses contribute markedly to state production and employment, they often pay taxes on business income through the individual income tax. Raising taxes on these firms will not encourage continued post-recession economic recovery, especially in those areas of the state still struggling to realize economic gains. Further, median household incomes have remained flat. This is accompanied by public uncertainty regarding the state of the U.S. economy, resulting in perceptions that income has failed to recover to pre-recession levels, something that will likely affect consumers’ willingness to purchase. Increased tax liability reduces after-tax income for low- and middle-income Coloradans, making it more difficult for them to afford basic necessities such as food, shelter, utilities, and health insurance. Colorado Secretary of State, Results for Proposed Initiative #22, Ballot Title Setting Board (2013-2014), http://www.sos.state.co.us/pubs/elections/Initiatives/titleBoard/results/2013-2014/22Results.html. Mark Vitner & Sara Silverman, Colorado Economic Outlook, Wells Fargo Economics Group Special Commentary (Aug. 7, 2013), at 1, https://www.wellsfargo.com/downloads/pdf/com/insights/economics/regional-reports/Colorado_08072013.pdf [hereinafter Colorado Economic Outlook]. Colorado Economic Outlook, supra note 2, at 2. Colorado Legislative Council Staff, Focus Colorado: Economic and Revenue Forecast (Sept. 20, 2013), http://www.leg.state.co.us//lcs/econforecast.nsf/vwFile/1309/$File/13SeptemberForecast.pdf, [hereinafter September Economic and Revenue Forecast]. Colorado Legislative Council Staff, Focus Colorado: Economic and Revenue Forecast (June 20, 2013), at 62-63, http://www.colorado.gov/legcouncil/Forecast/13JuneForecast.pdf; See also September Economic and Revenue Forecast, supra note 4. September Economic and Revenue Forecast, supra note 4. September Economic and Revenue Forecast, supra note 4, at 51. Keith Coffman, Colorado floodwaters menace state’s $41 billion agriculture sector, Reuters, Sept. 20, 2013, http://www.reuters.com/article/2013/09/20/us-usa-colorado-flooding-farms-idUSBRE98J09I20130920. September Economic and Revenue Forecast, supra note 4, at 42. September Economic and Revenue Forecast, at 41. Bell Action Network, Colorado Center on Law & Policy, & Colorado Fiscal Institute, Increasing income tax won’t harm Colorado economy, Amendment 66: Economic Analysis, http://www.cclponline.org/postfiles/Part_Two.pdf, [hereinafter Increasing income tax won’t harm Colorado economy]. Increasing income tax won’t harm Colorado economy, supra note 14, at 1. Increasing income tax won’t harm Colorado economy, supra note 14, at 2. National Bureau of Economic Research, US Business Cycle Expansions and Contractions (Apr. 23, 2012), http://www.nber.org/cycles.html. Pew Research Center for the People & the Press, Five Years after Market Crash, U.S. Economy Seen as ‘No More Secure, Sept. 12, 2013, http://www.people-press.org/2013/09/12/five-years-after-market-crash-u-s-economy-seen-as-no-more-secure/ [hereinafter Pew Poll on U.S. Economy]. Congressional Budget Office, Taxing Businesses Through the Individual Income Tax (Dec. 2012), at 1, http://www.cbo.gov/sites/default/files/cbofiles/attachments/43750-TaxingBusinesses2.pdf. Robert Carroll & Gerald Prante, The Flow-Through Business Sector and Tax Reform, Ernst & Young LLP (Apr. 2011), at 16, http://www.s-corp.org/wp-content/uploads/2011/04/Flow-Through-Report-Final-2011-04-08.pdf, [hereinafter Ernst & Young Flow-Through Business Sector Report]. U.S. Small Business Administration, State & MSA data, Statistics of U.S. Businesses (2010), http://www.sba.gov/advocacy/849/12162. Michael Mazerov, Cutting State Personal Income Taxes Won’t Help Small Businesses Create Jobs and May Harm State Economies, Center on Budget and Policy Priorities (Feb. 19, 2013), http://www.cbpp.org/files/2-19-13sfp.pdf [hereinafter CBPP Report on Cutting State Personal Income Taxes]. Ernst & Young Flow-Through Business Sector Report, supra note 22, at 15. U.S. Small Business Administration, Frequently Asked Questions (Sept. 2012) at 1, http://www.sba.gov/sites/default/files/FAQ_Sept_2012.pdf. Kathryn Kobe, Small Business GDP: Update 2002-2010, U.S. Small Business Administration (Jan. 2012), at 1, http://www.sba.gov/sites/default/files/rs390tot_1.pdf. Governor’s Office of State Planning and Budgeting, The Colorado Economic Outlook—Economic and Fiscal Review (Sept. 2013), at 35, http://www.colorado.gov/cs/Satellite?blobcol=urldata&blobheader=application%2Fpdf&blobkey=id&blobtable=MungoBlobs&blobwhere=1251889463031&ssbinary=true [hereinafter Colorado Economic and Fiscal Review]. CBPP Report on Cutting State Personal Income Taxes, supra note 24, at 4. Dennis Jacobe, Healthcare Costs, Taxes Worry U.S. Small Businesses Most, Wells Fargo/Gallup Small Business poll (Jan. 25, 2013), www.gallup.com/poll/160100/healthcare-costs-worry-small-businesses.aspx?version=print. Due to the federal government shutdown and the lack of available data during this time, the latest available data is from 2011. See Amanda Noss, Household Income for States: 2010 and 2011, U.S. Census Bureau American Community Survey Briefs (Sept. 2010), at 5. Governor’s Office of State Planning and Budgeting, The Colorado Economic Outlook—Economic and Fiscal Review (Sept. 2013), at 54, http://www.colorado.gov/cs/Satellite?blobcol=urldata&blobheader=application%2Fpdf&blobkey=id&blobtable=MungoBlobs&blobwhere=1251889463031&ssbinary=true. Colorado Commits to Kids, The Bottom Line for Your Taxes, http://coloradocommits.com/point/the-bottom-line-for-your-taxes/, [hereinafter The Bottom Line for Your Taxes]. Bureau of Labor Statistics, Jonathan Church & Ken Stewart, Average Food Prices: a snapshot of how much has changed over a century, (Feb. 2013), http://www.bls.gov/opub/btn/volume-2/average-food-prices-a-snapshot-of-how-much-has-changed-over-a-century.htm. The Bottom Line for Your Taxes, supra note 33. According to a news article in the Colorado Springs Gazette last year, the cost to heat a home during the coldest months of the year is typically around $117 per month. See Rich Laden, Home heating bills headed down in areas outside Colorado Springs, Colorado Springs Gazette, Mar. 1, 1012, http://gazette.com/home-heating-bills-headed-down-in-areas-outside-colorado-springs/article/134423. Internal Revenue Service, SOI Tax Stats—Historic Table 2, Colorado Statistics of Income for Tax Year 2011, http://www.irs.gov/uac/SOI-Tax-Stats—Historic-Table-2. Tax estimates were calculated using Colorado Commits to Kids Tax Calculator, found at http://coloradocommits.com/calculator/. The estimated monthly cost of feeding a one-year-old child a healthy diet for one month is $109.58, which is roughly $27 per week. See Andrew J. McDermott & Mark B. Stephens, Cost of Eating: Whole Foods Versus Convenience Foods in a Low-income Model, 42 Family Medicine 280, 280-284 (Apr. 2010), at 281, http://www.stfm.org/fmhub/fm2010/April/Andrew280.pdf.